Coqui The Chef Makes Everything Except French Flies! Or is it French Fries? What is the difference? Both are not good for your health. French fries have trans fat and flies just love rotten fat. Protect your heart from fast food french flies, oops fries. There are healthier and more creative ways to eat fries. Try this recipe from wikiHow and start making reduced fat french flies. Oh gosh, fries. Someday I'll get this right. Hasta la vista, koh-kee, koh-kee! 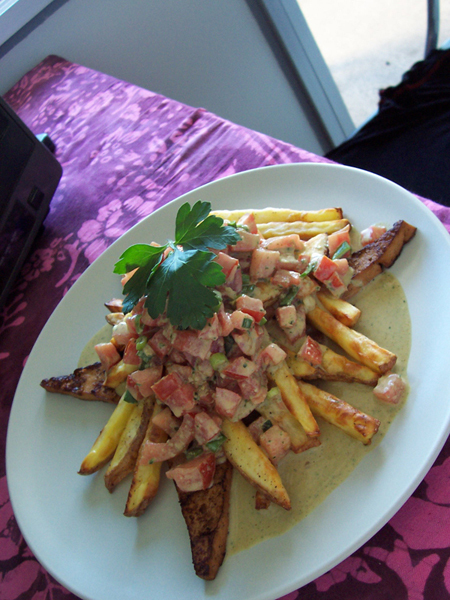 This is a recipe that you can use to make french fries with no fat. It only takes about 20 minutes from start to finish when you get the hang of it. It may take a couple tries to perfect, but it's worth it! Wash (and peel, if you prefer) enough potatoes for everyone eating. Use 2 medium potatoes (smaller than your fist) per person. Slice each potato to about 1/4" thickness. You can slice whichever way, depending on what length of fry you like. Then cut each slice into french fry shape. Spray a cookie/baking sheet with cooking spray, and arrange potatoes in a single layer. Spray the tops of the potatoes with butter spray. You could also use Pam; it will have less flavor but will do the trick. Use your favorite spices over the fries. Some recommended spices are garlic salt, paprika, chili powder, and black pepper, but you can use whatever tastes best to you. Remember, more seasoning = more potent taste, so be careful. Put the pan in the oven (middle or higher), and turn to "Broil" for approximately 10-13 minutes. Watch for the tops to become crispy brown, but not burnt. Remove pan from the oven, and turn potatoes over. Caution: Pan is very hot! Put potatoes back in oven, broil for another 6-8 minutes, or until the other side is crisy and brown. Serve immediately. For added bonus, put some shredded cheddar cheese on top after you plate the potatoes. Try using olive oil flavored nonstick cooking spray when baking low-fat french fries. Add a light sprinkle of Montreal Steak seasoning about half way through baking. Do this when the french fries are turned for even browning. Baking fries at 425 to 450 degrees F tends to warp the pan less while allowing the fries to become crisp. Broiling is a good option too. If baking the french fries, and this would probably work for broiling them too, place the cut french fries on a microwave-safe platter. Microwave until heated through and a bit steamy. This will speed the cooking time while removing some of the starchy taste. Place the heated french fries onto the baking sheet and continue as above. Soak the cut french fries in ice water for about 30 minutes before cooking. Drain well and follow as directed. Use russet potatoes to make french fries. Red or new potatoes are too waxy. Note: You will very likely lose this baking sheet for other purposes, because it will warp in the oven. You might want to buy one at a dollar store for making french fries only. Be careful while removing the pan from the oven for it may be quite hot. Leave the half heated fries in the oven for about 2-5 minutes to cool before removing them to reduce risk of burns. Article provided by wikiHow, a collaborative writing project to build the world's largest, highest quality how-to manual. Please edit this article and find author credits at the original wikiHow article on How to Make Reduced Fat French Fries in 20 Minutes. All content on wikiHow can be shared under a Creative Commons license.